Previously on GWS: A mashup between Mickey Mouse and an Optimus Prime Transformer afflicted my ocular cavities with a virulent strain of suckitosis. This week, John at Super Punch points us to this Ripley Mouse image created by kronik_1973 at Mojizu. A rather hostile (and annoying) creature, Ripley Mouse will readily engage any being in battle…and is also likely break into a song and dance number when the opportunity presents itself. And you know what? It doesn’t actually compel me to hurt myself or others. 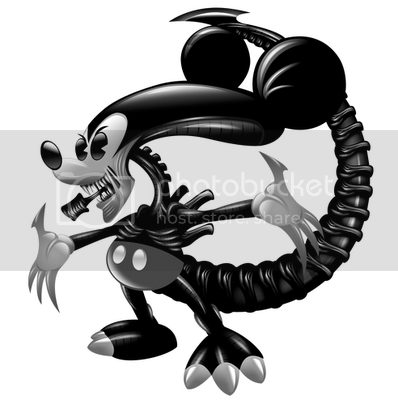 In my view, Mickey Mouse’s lameness has been all but balanced out by the savage awesomeness of Aliens and of kronik_1973’s artistry. But I could be wrong. Ha, ha, ha! Just kidding. No I couldn’t. I haven’t been wrong since I sold all of my Jim Lee issues of Uncanny X-Men on Ebay for $30. And that was in the late 1990s. Oh, you did NOT just call me out. Or call the Mouse lame. Fine, you got me: this is not cute. Well, except the feet. Those are on the adorable side. And the buttons – those are sweet, too. @cshanyn Now you’re just trying to antagonize me.